A mid winter trip to summery Queensland combined with the World Cup and the start of the Tour de France has put my reviewing well and truly behind again. Here are 6 beers that have earned me Untappd badges since the start of July. I've really got into my Italian beers lately and the Gondolier (Level 3) is evidence of this. The beer was Birra del Borgo's Cortigiana, a Belgian Pale/Blonde Ale. It's readily available in a 750ml bottle at Dan's and had light Belgian characteristics but for me was a little bland. My badge whoring tendencies got the better of me again. I didn't understand the reasoning behind this badge but if you had a Newcastle Brown Ale, which I thankfully always have in the fridge, on Independence Day Eve you got the middle badge below... I'm not complaining! I also realized I've never reviewed it before, I might need to fix this in the near future. When I think of the Czech beers, Hefeweizen's aren't the first style that springs to mind. Hence my surprise when I found Praga Hefeweizen. Heffenista (Level 4) is the badge that means I'm talking about it now. The beer itself was quite good, plenty of banana and bubblegum flavours. 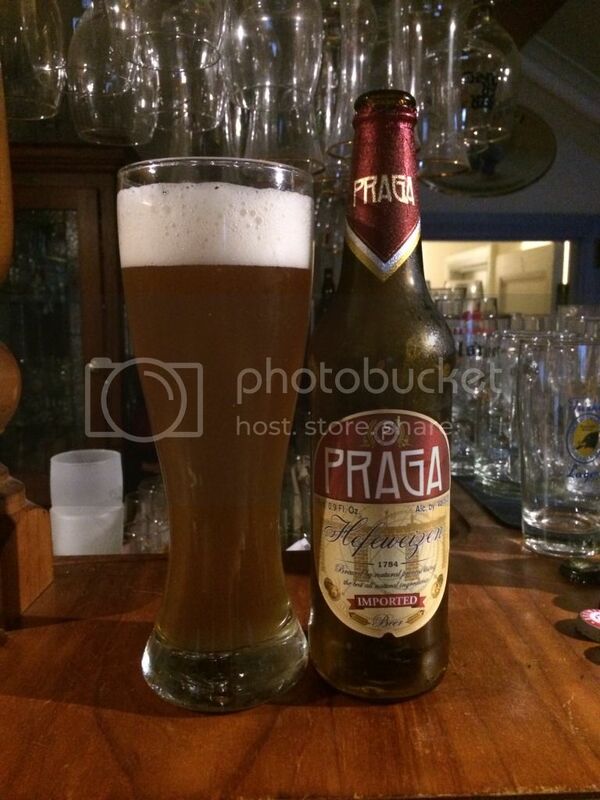 Praga Hefeweizen had a good sized head and was quite clear, suggesting it was a filtered Hefe. Personally I thought it was quite good, to the point that I would buy it again if I come across it. A good affordable Hefeweizen. The ubiquitous Independence Day 2014 badge has come and gone. For no reason at all I had quite a big night on Independence Day and my first beer was Sixpoint Spice of Life - Ella. It was in a growler from Tru Bru and it was so good! Ella is an Australian hop, and is a less intense version of Galaxy. The beer was resinous and lightly spicy and fruity, it was a lovely IPA that I'd highly recommend everyone trying. I'm also keen to get my hands on more of the Spice of Life beers. Once again I have a beer that crosses over between the Bear Club review and Untappd badges. The beer was Avec les Bons Voeux from Dupont, which Untappd classifies as a Saison. That I disagree with, it's clearly a Tripel! Being from Tru Bru I had it on tap, although if this beer is even half as good in the bottle it will still be a sensational beer! If you are a lover of Belgian beers go seek this one out, it's a seriously good Tripel/Saison/Belgian Strong Pale Ale/whatever you want to call it! I'm not sure what's going on with the Brew Traveler badge but I got another level (now level 7) in my bar yesterday. It was even my first beer! In fact it was my third and it was pretty sensational. Weihenstephaner's Hefeweissbier is simply the best Hefeweizen on the market! Full stop, no questions asked - this is the quintessential Hefeweizen and a must try for all beer lovers! Check out a full review here if you still have more questions. Six more Untappd badges down. There's a number of really good beers in this lot that I would highly recommend you checking out. I've really got back into Hefeweizen's recently, after going off them for a while, so really pleased to see two get in this Untappd Catchup. The pick of the beers in this catchup would have to be the Bons Voeux, which you'll hear more about when I finish my Bear Club review. I've got plenty of beers on order at the moment so expect the next few months to be chock-a-block full of new stuff. Cheers guys!